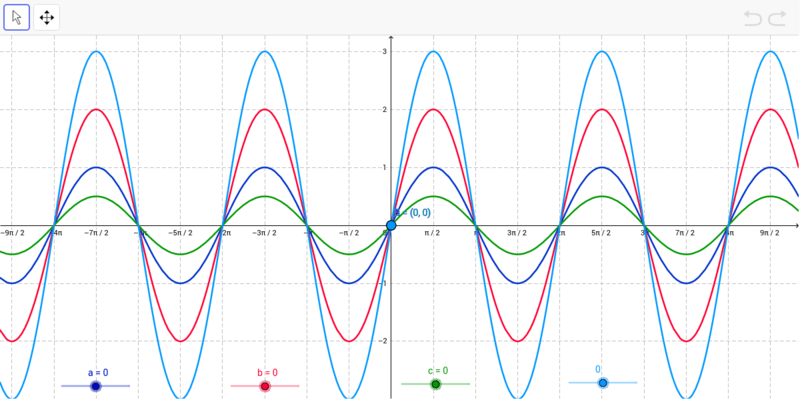 Use these graphs to complete the 1st section of the trig functions transformations project. Use the arrow tool to select a graph and to move the sliders. Use the crossed arrows tool to move the graphs around. The small triangle in the bottom right corner of this tool will show the other tools available to zoom in and out and to hide and unhide graphs. As you move the sliders, the corresponding point will move. Use this information, as well as your observations to graph several points for each equation, including the high and low points, the intercepts, etc. The coordinates of the current location of the point will be shown next to it. Each point is the same color as its graph and the slider.